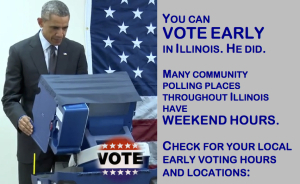 Many Early Voting polling places in Chicago, the suburbs and throughout Illinois have weekend voting hours. This important election will determine our state leadership and the makeup of the Illinois General Assembly. Make sure your voice is heard. Check out your local Early Voting polling place and hours.